eCite - Are current psychometric tools suitable for measuring outcomes of diabetes education? Are current psychometric tools suitable for measuring outcomes of diabetes education? 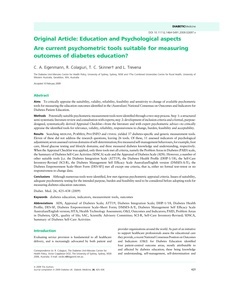 Aims To critically appraise the suitability, validity, reliability, feasibility and sensitivity to change of available psychometric tools for measuring the education outcomes identified in the (Australian) National Consensus on Outcomes and Indicators for Diabetes Patient Education. Methods Potentially suitable psychometric measurement tools were identified through a two-step process. Step 1: a structured semi-systematic literature review and consultation with experts; step 2: development of inclusion criteria and a formal, purpose designed, systematically derived Appraisal Checklist—from the literature and with expert psychometric advice—to critically appraise the identified tools for relevance, validity, reliability, responsiveness to change, burden, feasibility and acceptability. Results Searching Medline, PubMed, PsycINFO and Cinhal yielded 37 diabetes-specific and generic measurement tools. Eleven of these did not address the research questions, leaving 26 tools. Of these, 11 assessed indicators of psychological adjustment; seven assessed various domains of self-determination; five measured self-management behaviours, for example, foot care, blood glucose testing and lifestyle domains; and three measured diabetes knowledge und understanding, respectively. When the Appraisal Checklist was applied, only three tools met all criteria, namely the Problem Areas in Diabetes (PAID) scale, the Summary of Diabetes Self-Care Activities (SDSCA) scale and the Appraisal of Diabetes Scale (ADS). However, a number of other suitable tools [i.e. the Diabetes Integration Scale (ATT19), the Diabetes Health Profile (DHP-1⁄18), the Self-Care Inventory-Revised (SCI-R), the Diabetes Management Self Efficacy Scale Australian/English version (DMSES-A⁄E), the Diabetes Empowerment Scale–Short Form (DES-SF)] met all except one criteria, that is, either no formal test–retest or no responsiveness to change data. Conclusions Although numerous tools were identified, few met rigorous psychometric appraisal criteria. Issues of suitability, adequate psychometric testing for the intended purpose, burden and feasibility need to be considered before adopting tools for measuring diabetes education outcomes.